Equine Facilitated Therapy (EFT) is described as an opportunity to learn more about yourself and how you communicate, with the horses reflecting how you interact with others, affect other people and how others affect you. It all sounds good to me! There was a nervous excitement in me as I turned up at the equine centre. Ever since I had heard about EFT, I’d wanted to experience it, so here I was – ready with an open heart and open mind. I’ve always sensed a depth of feeling in equines – no wonder they can form such enduring bonds within their herds, but also with those who care for them. And I longed to get a bit closer in and to feel it for myself. The weather that day was awful (following days of lovely sunshine) and not conducive to spending two hours outside in a field of horses. But there was no way I was going to be put off now that the EFT day was finally here. The session started with a chat about how I was feeling, and what I hoped to gain from the session, and the obligatory health and safety check. I confessed that I’d forgotten to bring my steel-toed work boots, but my instructor told me that my wellies were just right. She explained that some of the horses are so big and heavy that if my foot was trodden on in steel-toed boots, the metal would be crushed into my foot. Mental note to self: keep feet away from hooves! I explained that the thing I hoped to gain from the session was a moment of deep connection with a horse; perhaps a soul connection. I was taken through some preparatory exercises to sense what was going on in me and to slow everything down inside. Having explained about how to approach each horse quietly and with respect for their personal space, and how to read subtle changes in body language, I was let loose into the field of horses. They were all rather intent on eating, earnestly pulling at the grass or piles of hay, so they were not concerned or interested in my tentative requests to make contact. But they didn’t mind me there, and I certainly sensed different emotions with the two I did approach. The smallest horse was a young male. I felt incredibly emotional in his presence, overwhelmingly so. I found out later that he’d had a rough start in life. The other horse, a magnificent Shire, gave me a totally different feeling – sort of quick and excited; he was altogether a more confident, mature horse. But from both, I got the sense that they were very happy to be living there in that special Equine Centre. Eventually the rain and cold drove us inside to the stalls. Housed in here were two of the instructors own beautiful mares. I had been drawn to them earlier, but respectful of their need for space and privacy as they each had a note to say they had only recently arrived at the Centre and were still settling in. However, the instructor said that it was fine to greet them, as the signs were there to ensure they weren’t overwhelmed by attention from visitors. So I quietly approached one of the mares – then it all changed. I gazed softly at the black Shire mare in front of me. I let her sniff my hand and gently touched her neck when I felt she was happy for me to do that. Her long, thick fringe almost covered her eyes but I could see the gentle spirit that shone through. My instructor explained that she had been through a very difficult few months, having been grief-stricken with the sudden death of her two month old foal. I felt an incredible tenderness and gently stroked her. “You can go in with her if you want.” I was told. 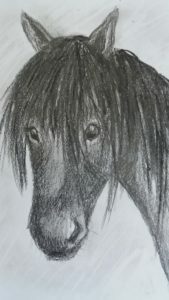 Without hesitation, I entered her stall – there we were – one small human and one beautiful and impressively huge Shire mare, together in a few moments of quiet understanding and exchange. She was incredibly sturdy yet gentle – what a warm, loving spirit. A lump formed in my throat – her grief was palpable. I sent her healing thoughts holding my hands on her. A little later I quietly withdrew, knowing that something had passed between us. As I walked away afterwards, I reflected on her grief, and on the depth of feelings that these beautiful ‘other people’ have – often not recognised in our world. But today it was recognised, respected and revered. What an honour.